This sophisticated glider recliner provides the ultimate in comfort to your home. With this chair, you can slow the pace of your busy life in a living room or family room for a great space to watch TV or simply spend time relaxing with family and entertaining friends. 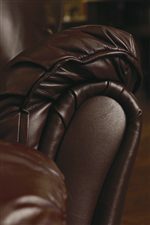 Customize the look of the glider recliner with many custom order leathers and fabrics available. Also available with a glider swivel base. The Alpine Contemporary Glider Recliner by Lane at AHFA in the area. Product availability may vary. Contact us for the most current availability on this product.